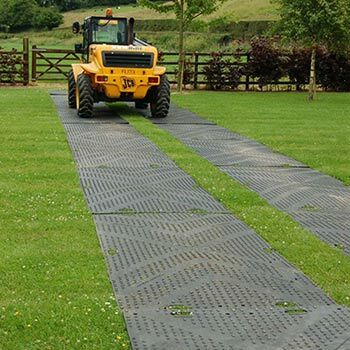 Specially designed for outdoor use, Diggermats EnduraMat can be used as temporary roadway as it enables you to drive cars, forklifts, diggers, trucks & cranes up to 80 tonnes, without causing significant damage to the ground underneath. Diggermats EnduraMat is also suitable for pedestrian access thanks to its innovative design of anti-slip surface (small grip on the pedestrian side, bigger grip on the vehicle side). Diggermats EnduraMat are £120 per mat and we distribute to anywhere in Ireland. Contact Kitty on 07710487440 or 02889561820 for any queries. *when used in accordance with manufacturers recommendations.